A1Savannahs SBT Carley being sent to Germany to begin a new breeding program. February 13th, 2017 - A Kitty that Saved a Life. I'm writing you to tell you a tale. Of a wonderful kitty that saved my life. My husband was injured on the job, making it so I had to drive solo for a short time. During this time I had become ill and was having a hard time controlling my blood sugar. I am a diabetic and my sugar levels kept dropping to low. Now Nika has a habit of biting and pulling my hair when I'm sleeping to wake me when she is hungry. This one night I had fed her just before going to bed, knowing she would have enough to get her through the night. Around 10:30 that night, only 2 hours in to sleep. She started it up. Pulling my hair, pawing my face and meowing in my ear. I told her she had food and to leave me be. She didn't give up and didn't stop till I sat up. When I did I knew there was something wrong, with me. I checked my sugar level and found I was dangerously low, as in almost time to send me to the hospital kinda low. If it wasn't for her I could have ended up in a coma and no one would have known. It was only her and I in the truck. I knew dogs could smell the change and notify/wake the person but I never thought of cats doing it. She has done this for me once more in the last month. As it turns out I had a major infection, in side, that I didn't know was making me so sick. And messing up my sugar control. So there it is. A tale of a kitty, I got from you. My Nika, my life saver. January 1st, 2017 - Launch New Web Page and Logo! Launching this new web page and logo has been a long time coming. We have been working with a fantastic team for about a year to put this all together. We still have a lot of work to do and still have several new changes in store for A1Savannahs but one step at a time. We want to thank all of our customers for being there and giving us the feedback that we need and a huge thanks to Jen for all of your hard work helping us put the site together! A1Savannahs was featured in a German documentary about the Neanderthal and the possibilities of Genetics. Click link Here to see the video. A1 Savannahs Caline (Athena) has been awarded all her titles in two shows in 2016. We are please to announce that one of our owners, Amanda, has completed the FCF (Feline Conservation Federation) Husbandry course and is now certified in Exotic Feline Husbandry. We had a fantastic week at the convention, we learned a lot, and met tons of amazing people. We look forward to next years convention! 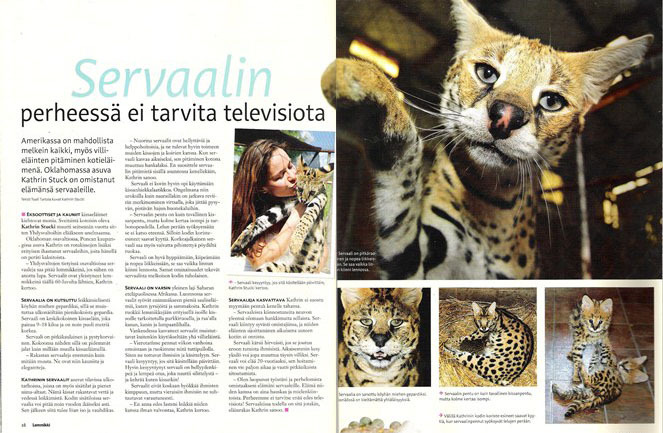 In Cat Fancy May 2014 issue, A1 Savannahs is interviewed for information on the Serval and the Savannah Cat Breed. Congratulations to Champion A1 Savannahs Caline. 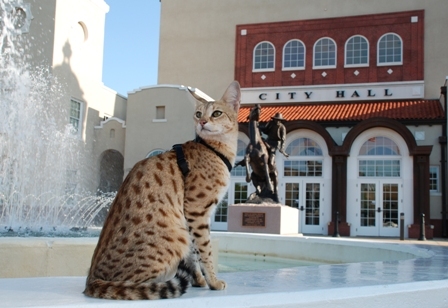 She has attended ONE show and has been awarded the best silver spotted Savannah of the year. In September 2013 , The Stucki Family stepped down from breeding these wonderful cats and handed it to long time Family Friends, The Engster’s. Martin, and Amanda have devoted their time into learning the ends and outs of the Savannah Breed in order to properly care for their new Dream. A1Savannahs sent two F4 kittens and one F3 kitten females to Switzerland to be the newest addition to breeding program. In TICA, this is the highest title awarded to cats in the championship classes. A cat must first become a Quadruple Grand Champion before it can begin to compete towards the title of Supreme Grand Champion. 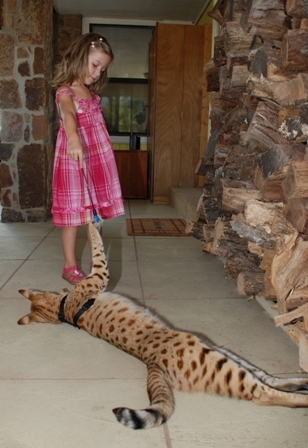 In the Savannah breed world, no other cat before has ever achieved this. Scarlett's Magic was born on March 6th of 2008. Just a year later achieved a world record in when she measured 41.87 centimeters or 16.49 inches from shoulder to toe. Only a year later, she goes to break her own record by growing over an additional inch, measuring 45.9 centimeters or 18.07 inches from shoulder to toe. In 2010, Scarlett’s Magic was also awarded a second Guinness World Record for longest, living, domestic cat (feline) at 108.51 centimeters or 42.72 inches in length and she is the first animal to hold both of these two Guinness World Records simultaneously. Also on March 12, 2010, Scarlett’s Magic was awarded the "Key to the City" of Corona, California for her role in the local community and recognition by the Guinness World Records. She has also made several national television appearances including on Live with Regis and Kelly and even Animal Planet. Scarlett's international achievement can be seen on page 155 in the 2011 Guinness Book. A Ponca City farm specializes in a rare breed of cat. Upon entering the Stucki home, visitors immediately discover A1 Savannahs is rampant with exotic, spry spotted kittens enjoying the good life, pouncing and leaping, playfully swatting at each other, entertaining themselves and spectators alike. See full article.